As we can see, first a single angel appeared to the shepherds, and then a “multitude of the heavenly host” joined this angel, praising God. This must have been astounding beyond comprehension for these simple and unpretentious men who lived the quiet lives of watchers of sheep and who were accustomed to long hours of stillness in the night hours. We really have no idea how those shepherds must have felt on that night. We have seen so many nativity scenes of the shepherds with their staffs and long clean robes (white robes with powder blue accents seems to be the favored colors) that it is difficult for us to imagine what these men really were like. I called them unpretentious, and so I think they were, but these were also rough and probably ill-mannered men. They were of the lowest class of the local society, and their demeanor no doubt made that obvious. Anyone who has worked with livestock of any kind knows that clean chore clothes do not stay that way very long; and if working with livestock is really a person’s only life, he often does not bother to clean up very much. These shepherds were also men who were not accustomed to unusual events coming into their lives. 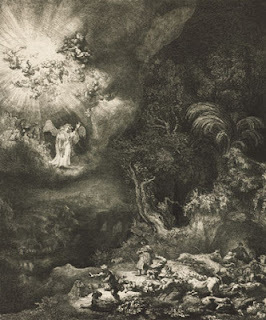 “Today is pretty much the same as was yesterday, and tomorrow will be a repeat of today.” It is no wonder that they were “sore afraid” (as it is put in the King James’ English) when they saw the angel and the “glory of the Lord,” (whatever that actually was). When one thinks of these staggering events of the evening as compared to their normally quiet life, it is almost surprising that these shepherds were able to grasp the information that the angel told them about how to find the Christ child. As I try to imagine what the shepherds must have felt that night; the news that God brought them good tidings of great joy was probably the type of news that they did not hear very much in their daily lives. Another thing that they probably did not hear was that God was “pleased” with them (at least this was the inference). People in the lower rungs of society usually are not accustomed to someone telling them that they are pleased with them. Usually they are made to feel like they are a nuisance or that they are in the way. Yet God sent His message to these unpretentious men. It was a message of peace. Despite what the powerful and influential people of our world would have us believe, peace in our world is not negotiated in the U.N. building, nor is found in treaties made in the highest ranks of government between rival and competing nations. Peace is found one person at a time. It is not found in the pride of men, but in the lowly. It is found in the simple things of life. Peace is not found in the movers and the shakers of the world, but in the humble and the merciful. The snow came in like a torrent. Covering every tree limb and beast. Searched out every crevice and crease. They’re small, but not in the least frail. Stood contently – backs to the gale. As annoying the cats in the mow. She runs out to pester the cows. They preferred the warmth of their coop. (They tend to do things as a group). I busied myself on the farm. Enjoying all this bucolic charm. It is December and we are entering into the Christmas season. The choir at our church sang a song yesterday that reminded me of a poem that I wrote on Christmas Day several years ago. 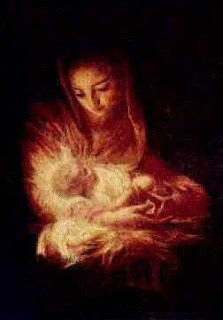 The first part of the poem (From Mary to me) is loosely based on the song that Mary sang (the Magnificat) after she learned that she was to give birth to Jesus Christ, the Messiah. And say what no tongue can. My spirit must express my mind. And sing my song to all mankind. Though in humility I dwell. And now His majesty I tell. Great and holy is His name. His arm does mighty deeds. And the hungry ones He feeds. He has chosen to exalt. Stuck down by prideful faults. For truly blessed I am. With the faith of Abraham. His tired little head will nod. He is the stalwart Lion. He is the Paschal Lamb.